My father, Dr. R.I. Bromley, was a typical country doctor. When he came to Sonora in 1887 the big gold boom was over. There was still a lot of mining but most of it was done by companies and it was deep mining requiring lots of money. on his lap when he went on out-of-town calls. One time he was on a late call near Chinese Camp. He was going along a creek where on each side of the road there were thick willows. Hamlet, his horse, was going slowly and my dad was relaxed almost drowsy. Suddenly man stepped out of the bushes. Instantly my dad became alert and reached for his pistol. When the man saw the pistol, I guess he thought it best to waylay an unarmed person so he went back into the bushes. We had one of the first telephones in town. It seemed to be ringing day and night. Dad very rarely would have Thanksgiving or Christmas dinner with us. Up until I was about 8 years old dad relied on Hamlet to get him places in the buggy. Hamlet was a big stallion. He was kept in Pickles stables about a block away. Pickles Stables was on the side of the creek where Coffills Park is now. The horses were kept in stalls on the lower level. There was an inclined ramp going to the upper story where the buggies, carriages, and tack were kept. Someone would drive the buggies up to the big granite stepping stone by the sidewalk in front of our home and dad would get in and be on his way. Sometimes when I was with my Dad in the buggy on some of his calls, comfortably seated beside him, he would begin to sing and I would join him. We were accompanied by the clump, clump of Hamlet’s hooves. Neither of us could sing very well. Mother said Dad couldn’t carry a tune. She had a nice alto voice. But we enjoyed ourselves and I think Hamlet did too. If it was a very cold Winter night mother would put a firebrick in the kitchen stove. When it was red hot she would put it in a little tin drawer that fit into an oblong box that was covered with carpet. Dad put this under his feet and then a big lap robe over his knees. He was ready for the long ride to Tuolumne of wherever he had to go. Sometimes when it had been raining the streams were swollen. Lots of the creeks had no bridges. Hamlet, if the water was high, would swim across. Dad had to put his feet up on the dashboard when the water came into he buggy. When a women was having a baby, especially out in the country, he would stay by her as long as it took. If the birth was in the hospital the mother usually stayed 10 days. The price was $50.00 including prenatal care. Office visits in those days were $2.00 and a house call $5.00. Bemis, my friend, had an appendicitis operation and stayed in the hospital then days for $5.00 a day. Dr. Bromley was no businessman. He seldom kept books. Those who were honest paid him in one way or another. A well known and familiar character of our yesterdays in Sonora, was E.C. Frisbie – and the expressions – Frisbie’s store – or “down to Frisbie’s” were really by-words, for every housewife traded there – always hoping to get bargains. In fact, Frisbie’s store was known as a bargain store. Several years ago and old-timer told me something of Frisbie’s early life and his famous Rawhide Store. He came to California from Tennessee in the 1860’s – he drifted up into Tuolumne County where he conceived the idea of building a big general store in the county, near the famous Rawhide Mine – a rambling frame store with a long porch – and in front – a hitching rack fifty yards long. Frisbie was keen and alert – he advertised bargains and brought people to him – even from the town. In fact – everyone flocked to Frisbie’s from all over the county. He went to San Francisco about once a month and brought up quantities of auction goods – goods were piled almost to the ceiling – no system – no order- laces – silks – ribbons – all mixed with clothing – boots and shoes – counters full. Frisbie, shrewd and keen – conceived the idea of serving a free lunch to customers; families came – enjoyed a lunch – had an outing and went home loaded down with household goods. A man told me that his parents bought his pants from Frisbies and they were not a masterpiece of tailoring – just pants – big and wide. Those pioneers were none too flush, and they loved bargains – and Frisbies had them (or was suppose to). It was said he always kept a barrel of good whiskey in the cellar and his good male customers were treated to a “dram” or two. After a few very lucrative years Frisbie’s friends urged him to come to Sonora, so he opened a store where Baer’s store now is. The same method – the same type of goods – and soon Frisbie’s counters were piled high and people flocked there for bargains. Although there were piles of cheap shoddy goods it was said shrewd housewives with good judgment came early and bought beautiful things. There was a little room in the back full of shoes- as children, we bought cloth-top button shoes – you fit yourself – and paid for them – but they never did fit – and there was “no come back”. Frisbie had no salesmanship – if you liked a thing, you took it – or you left it – it mattered little to him. Frisbie was a peculiar character of tremendous size weighing almost three hundred pounds – his feet were too small to carry his weigh, so he would sit in front of his store by the hour on a big barrel chair – his feet on a bench. In the store he would lie on the counter, full length, and take a nap. He employed two young clerks for a few years, but his methods must be carried out. Free and easy methods – in those free and easy days – but Frisbie amassed a fortune which he left to a few friends who had been kind to him through the years. To us, Frisbie’s Store was a real institution – there was not another like it – and there was never another Frisbie. In trying to recapture so many impressions of childhood – and such a green, healthy world it was – there is a parade of characters before my eyes – figures that would bring a smile to some today – so far out of tune they would be with the modern age. But I recall them tenderly, for, were they not a colorful part of Sonora’s yesterday? Some were strange, some comic, some a wee bit queer, but even they awaken tender memories. The three Mocomber brothers – would I were a Dickens to bring them to you in picture as I remember them – real characters , such as you rarely meet in a lifetime – elegant, cultured, aristocratic, the three brothers lived together in a little vine-covered cottage nestled in their orchard in north Sonora. There was a white picket fence around the whole place and a gate that clicked – a little dirt path leading around to the back door. Here were beautiful shade trees and a grapevine arbor where hung luscious bunches of black grapes in the Fall – a squeaky pump that brought up sparkling cold water. Scattered around the grounds were cider mills, pickle works, packing houses, warehouses, etc., and here were turned out the fine Macomber products – a champagne cider famous throughout the West – sweet cider – vinegar – pickles, such as no one has ever been able to make since; I am sure if anyone had the recipe today his fortune would be made. Here, under this shady arbor, Fred Macomber (he was the social greeter of the firm) dispensed sweet champagne cider and pickles to thousands – and much of it FREE, with that generosity of the old pioneers, they literally gave away fortunes. Children came in droves for pickles and sweet cider, and were never turned away. I lived not very far away and with other little girls we often stopped in on our way from school – there was always a kindly smile and never an impatient look or word. Fred always asked us to sing and we sat on the long bench and swung our feet, singing at the tops of our childish voices. Meanwhile we filled out “tummies” with pickles, apples, crackers and cider – we had not studied the vitamins or balanced diet in those days – anyway we were never any the worse for the mixture. When guest appeared, Fred would bring out a white pottery pitcher filled with pickles and another filled with sweet cider; when there were groups of older people or out-of-town guests, he would bring up form his cellar bottles of his famous champagne cider. It was a delicious product and many connoisseurs could not tell it from the real champagne. The Macomber pickles were put up in five gallon wooden kegs and were shipped all over the West – many local families would buy a keg in the fall for their Winter’s use. There were put up in pure vinegar – crisp and delicious. George was the eldest of the three brothers – tall and dignified – he wore a bushy black wig that fluffed out all around from under his tall silk hat – a black price Albert suit – stiff white shirt and collar and black bow tie – and carrying a gold-headed cane – an aristocratic figure as he walked into town. Fred was equally elegant in dress and manners – his bow was almost a real curtsy when he met a lady- truly, a gentleman to the manner born. The third brother, Henry, was not quite so elegant or aristocratic and in manner was different – it never occurred to us who did the hard work- perhaps Henry. They were all old men (or seemed old) when I first knew them, and I have often thought in later years that I would give anything to know of their early history. It was said they came here from New York and that they were descendants of Lafayette. It was said that Fred was very handsome in his younger days – a real Adonis; he had jet black hair, with a moustache and sideburns; these he dyed when I knew him – and very often the dye was not deftly applied – leaving streaks here and there – but these were minor things and only noticed, perhaps, by “giggly” little girls. Everybody loved the Macombers – everybody went “out to Macombers” – and when one by one they passed on, we missed them. We used to go out to see Fred in his last illness and his wan, white face would light up when we mentioned his fine cider and pickles. I love to think of the Macomber place as one of the beauty spots of my childhood – the deep lush blue grass in the orchard – the little, low white house that nestled so cozily among the trees. I love to think of the glad mornings when I tripped by on my way to school – the grass sparkling with dew and the air fragrant with mint that grew along the fence. And best of all – I am glad I knew such staunch, fine characters as the Macomber brothers – the memory is sweet. William Sugg was a slave, and was brought to California during the early days of the Gold Rush. 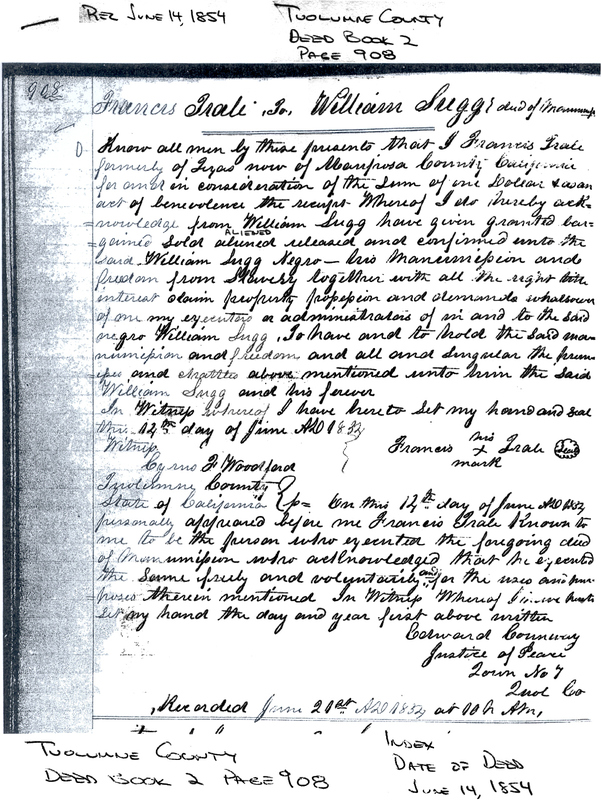 While most slave owners demanded several months of hard labor in the mines and large sums of money in return for even the possibility of freedom, Sugg was allowed to obtain his emancipation for the price of a single dollar as “an act of benevolence.” His deed of manumission is still on file in county archives. Sugg met and married Mary Elizabeth Snelling in the Merced area where the wagon trains of both pioneers originally settled. After they were married, Mary and William moved to Sonora. Where they built their home on Theall between Stewart and Shephard Streets. The family owned the home for approximately 125 years. The Sugg family became recognized, respected members of the community. For almost four decades, a portion of the home was used to house overflow guests from the City Hotel and Hotel Victoria (Sonora Inn). William established a harness-making business and Mary Elizabeth taught home arts such as quilting. The couple raised and educated eleven children there and together the close-knit family enjoyed music, reading and Bible study. With all that has been written about the California Gold Rush, it remains a little known fact that roughly 5,000 African Americans were an integral part of that unprecedented event and an estimated 500 mined in the Tuolumne County area.